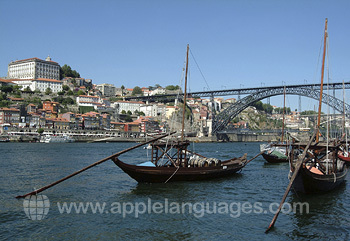 Learn Portuguese in Porto, Portugal’s beautiful second city, to see a different side of Portugal. Wandering around the city is like taking a trip back in time. Narrow, medieval streets wind down towards old, vividly-coloured waterfront buildings, passing ornate churches and grand governmental buildings en route. By the riverside you will find the lodges where the city’s famous port wines are stored and aged, attracting millions of tourists each year. Enjoy a glass of port with your dinner, before heading out to sample Porto’s vibrant nightlife. 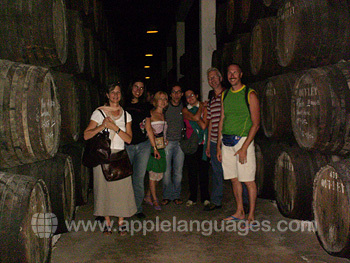 You could even practice your Portuguese with the friendly locals! From our school, you can reach the sparkling waters of the Douro in just a few minutes, and, going away from the waterfront, one of Porto’s best shopping areas is only a short walk away. Facilities at the school include five spacious classrooms (all with audio and visual equipment), a multimedia library, student lounge, computer room, free Internet access, microwaves and coffee machine. 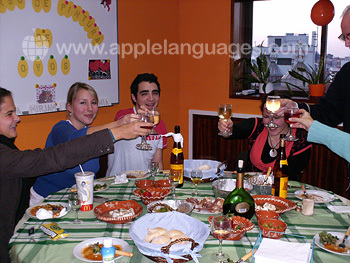 There are two types of Portuguese course at our school - group lessons and private lessons. All lessons last 50 minutes and run at different levels, from beginner to advanced. 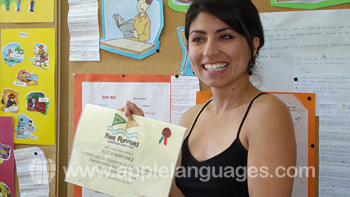 Our native Portuguese teachers are well-qualified, patient and experienced - and they know how to make learning fun! 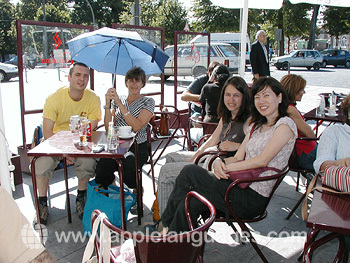 In your classes, you will study with a maximum of just five other international language students. Students interact with each other in Portuguese, helping you get to know other students, as well as the Portuguese language! Our Super Intensive course gives you 30 Portuguese lessons a week, 10 more than the Intensive course of 20 lessons per week. With a maximum of four other students in the class, you get lots of personal attention from teachers, helping you to make real progress with your knowledge of the language. 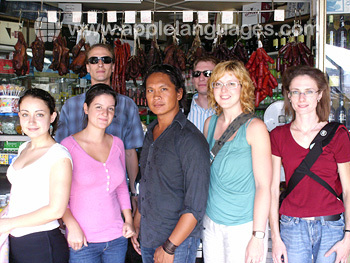 If you need to learn Portuguese even more quickly, our Private Lessons are perfect. Choose our Intensive course of 20 individual lessons a week, our Super Intensive course of 50 lessons, or our Executive Private Lessons, which offer you 30 lessons, concentrating on business vocabulary, every week. Both the Super Intensive Private Lessons and the Executive Private Lessons course include lunches with your teachers. Let them introduce you to the world of Portuguese cuisine! 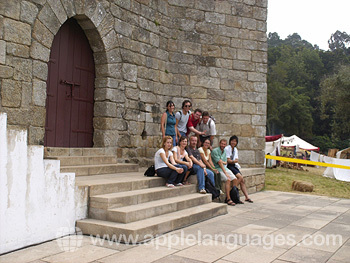 Our school also realises that your accommodation plays a major role in your enjoyment of your Portuguese course. 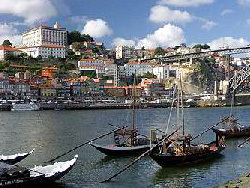 Staying with a Portuguese host family is the most popular accommodation option. 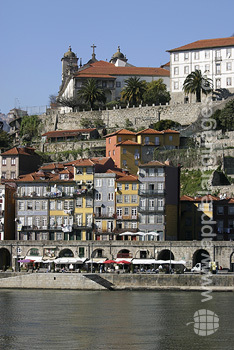 Each family lives within easy reach of the school and the centre of Porto. 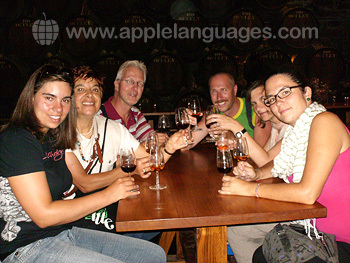 Experience Portuguese customs and traditions, and practice your language skills all the same time! Your host family will also provide you with breakfast each day. Our school takes great care when selecting families and also checks accommodation regularly, ensuring that you’ll be comfortable with your family. If you’d prefer your own space, the school can arrange accommodation for you in apartments, hotels or pousadas (lower cost hotels). Our school in Porto organizes a varied activities program, showing you everything that Porto has to offer and allowing you to become acquainted with other students. You will usually be offered the chance to see the picturesque Ribeira district of Porto, the majestic Cathedral, the exquisite Stock Exchange Palace and much, much more! You could also take a river cruise along the Douro, indulge in some fine port wine or experience the haunting melodies of fado music. With such a varied activities program, you’re sure to have a great time! For an extra fee, our school will pick you from the airport on arrival, and take you back to the airport when you depart. Average score for our school in Porto based on 24 previous client reviews. I thoroughly enjoyed my course. My level of Portuguese increased immensely thanks to the teachers at the school. I had 4 different teachers at the school and the vast majority of them were excellent. Also, the trips outside of the lessons were really interesting and gave me the opportunity to develop my Portuguese skills outside of class. I would without doubt recommend this school to anyone looking to learn Portuguese. I stayed with a Portuguese family for 3 months during my course and they were wonderful. They welcomed me with open arms and were always ready to help me, whether it be in terms of Portuguese or general issues. I really felt at home with my host family, I couldn’t have wished for a better one. Good and very competent teacher. The lessons were adapted to my level. Cosy house and friendly hostess. Staff and facilities at the school were very good. Accomodation and family were very good and family very friendly. The course was excellent in every way, the school is very good, professional and the staff is very friendly and competent. The atmosphere is also very nice. I statyed with a family with one child, they were very nice and open. I could have a talk with them or go to my room, they would respect me. A really useful course, with very few students per class. It's remarkable the focus on spoken Portuguese and verbs, the main weak points that I had before taking it. The owners of the house where I stayed did all that was in his hands to make my period enjoyable. They showed me the school before I started the course, took care of my transfer there and also brought me to my departure place on a trip on the Douro the first Saturday, and to the Airport the last one. 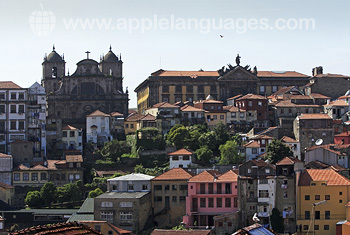 The school in Porto really deserves its name, I learned very fast to speak Portugueses .... and I will come again. The course and school staff were excellent, professional, their kindness and warmth made it great experience. The teachers were good and the course content and topics covered were also very relevant and good. I had a very good experience at the school in Porto - my Portuguese language skills improved a lot during my four weeks here and thanks to the interesting cultural program the school offered, my knowledge and appreciation of the history and culture, as well as the rich gastronomy of Porto and Portugal increased. After learning a lot about Portugal and the Douro region, I left with an even stronger desire to learn even more about this fascinating country. The course was good with excellent teaching methods. My host family was wonderful. The quality of the course itself was very high, with a school staff very friendly and professional. The accommodation was excellent and the family very welcoming and friendly too. Great location too, as close to the beach and to the metro line too. I enjoyed the course, the tutors were very helpful and friendly. The accommodation was good, and the host family whose appartment it was, were friendly. The school in Porto was small, which enabled the teachers to adapt the classes to the specific needs of the different students. Everybody was really friendly and highly capable; the stuff was always very helpful. My stay at the school was a real pleasure and I would love to return there again. 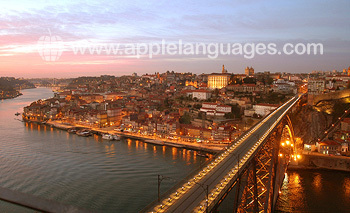 The accommodation offered by Language Courses Abroad and the school in Porto was excellent, in terms of living conditions, friendliness of the owner of the house, as well as location (very close to one of the stations of the excellent metro network of Porto). I had a great course, the teachers were very flexible and taught me well. I also had some interesting trips too and the family I stayed with were marvelous.